Jerry attended Arkansas State University in the late 80’s as a CADD major. After leaving school he worked as a fire sprinkler designer in Little Rock. Then worked as an electrical designer for a while. 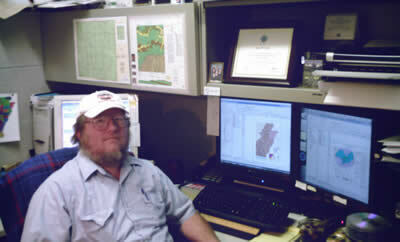 Then in 1999 he came to the Survey as a Cartographer building geologic maps and GIS work. He received his GIS certification from the GIS Certification Institute in July 2008. Jerry helps to organize, preserve, and analyze spatial data. He also helps with website updates for the agency.